Wisconsin Gov. 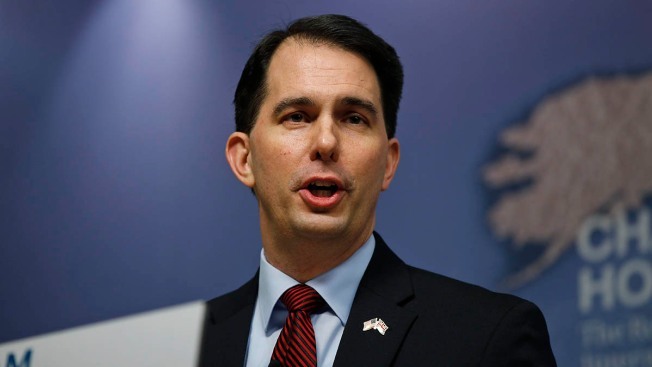 : "Maybe We're the Front-Runner"
Wisconsin Gov. Scott Walker delivers his speech at Chatham House in central London, Wednesday, Feb. 11, 2015. Wisconsin Gov. Scott Walker said there may be a message behind President Barack Obama's criticism last week of the "right to work" bill Walker signed into law. "Well, it suggests maybe we’re the front-runner [for the GOP nomination] if somebody is taking an active interest in what a state governor is doing, particularly in light of the fact that we’re not the only one," Walker reportedly said during a sit-down interview with Breitbart news. "Mitch Daniels in ’12 signed this, Rick Snyder, my friend in Michigan, signed it later that year. We are now the 25th State in America to have freedom to work." The president last Monday never used Walker's name but admonished the Republican governor's action as an attack on the working class. "It’s no coincidence that the rise of the middle class in America coincided in large part with the rise of unions – workers who organized together for higher wages, better working conditions, and the benefits and protections that most workers take for granted today. So it’s inexcusable that, over the past several years, just when middle-class families and workers need that kind of security the most, there’s been a sustained, coordinated assault on unions, led by powerful interests and their allies in government. So I’m deeply disappointed that a new anti-worker law in Wisconsin will weaken, rather than strengthen workers in the new economy. Wisconsin is a state built by labor, with a proud pro-worker past. So even as its governor claims victory over working Americans, I’d encourage him to try and score a victory for working Americans – by taking meaningful action to raise their wages and offer them the security of paid leave. That’s how you give hardworking middle-class families a fair shot in the new economy – not by stripping their rights in the workplace, but by offering them all the tools they need to get ahead." Walker's interview with Breitbart was conducted in California. He's been traveling the country as he mulls a run for president in 2016.